High strength woven geotextiles are made from high-tenacity polypropylene or polyester fibres. Layfield's high strength geotextiles are made primarily of polypropylene fibers but can provide materials blended with polyester or even full polyester geotextiles. HS PP woven geotextiles offer significant design strengths, with wide width ultimate strengths of up to 200 kN/m possible. Full polyester geotextiles can reach strengths as high as 1,000 kN/m. 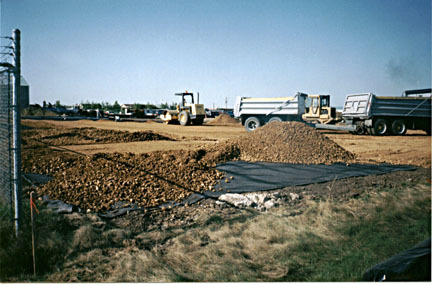 Layfield high strength geotextiles can readily be designed as reinforcement in temporary or permanent structures. HS PP woven geotextiles can be woven with one principal strength direction or with strength in both principal directions. HS PP woven geotextiles are used for road and embankment construction, tailings pond caps, for retaining wall construction, and in any area requiring high strength. Contact Layfield for information on other high strength geotextiles and for additional parameters and technical support. Need something with high strength AND high flow rates?